Situated on .85 acres in the dense core of the Ballard neighborhood of Seattle, Greenfire’s two buildings total over 30,500 SF and house apartments, offices and a restaurant. The grounds support urban agriculture and wildlife habitat, connecting occupants and passers by alike to the natural world. Building systems were selected to provide a balance between capital investment and life cycle costs. 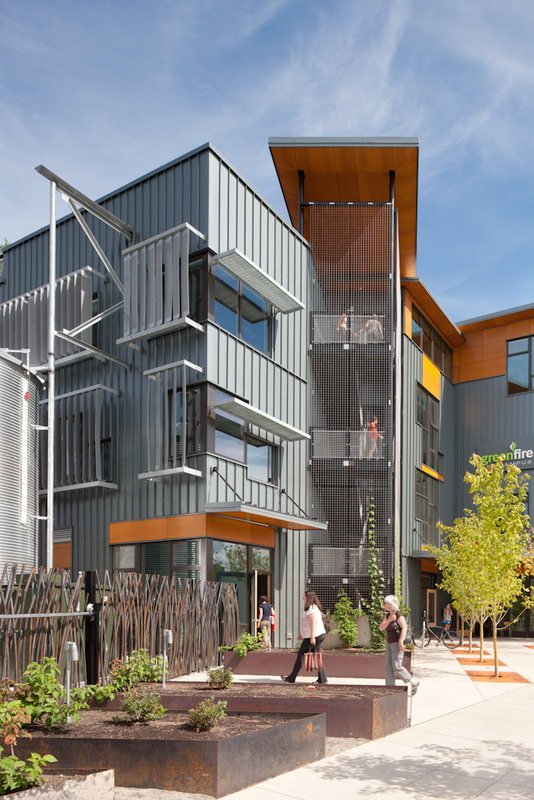 In addition to specific sustainable design strategies, the Greenfire Campus promotes social sustainability and livibility through a carefully orchestrated dialogue between the natural and man-made. The range of environments from restfull habitat for flora and fauna to busy streets and sidewalks creates an understanding of our place as stewards of the environment within an urban context. 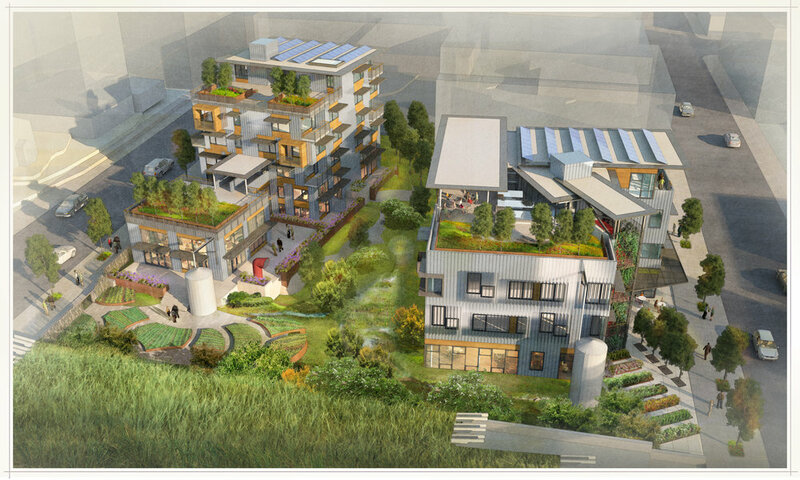 The project’s comprehensive sustainable design strategies include the use of geothermal heating and cooling, the exchange of energy between uses whose needs vary during the day, passive cooling through natural ventilation, provisions for edible horticulture, the use and reintroduction of rain and storm water into the earth with attendant reduction in infrastructure and the use of solar energy for heating, cooling, and daylighting. 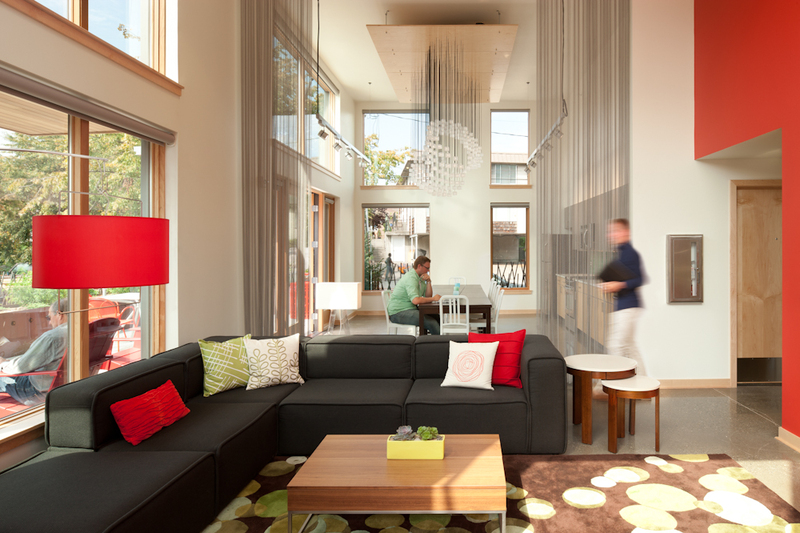 The Greenfire Campus goes beyond it’s technical sustainabilty achievements by promoting human interaction and understanding within a new sustainable core for the Ballard community.